Websterquilt: Quilt Qwazy Queens Blog Hop 2018 and Giveaway! 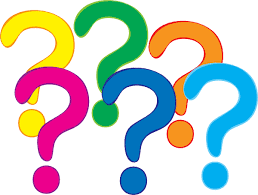 Quilt Qwazy Queens Blog Hop 2018 and Giveaway! This year Marian at Seams to be Sew challenged us Quilt Qwazy Queens to finish up a UFO project. I remembered I had these two blocks that I'd never done anything with. Originally they were going to be baskets for applique, but I wasn't in the mood to do that. 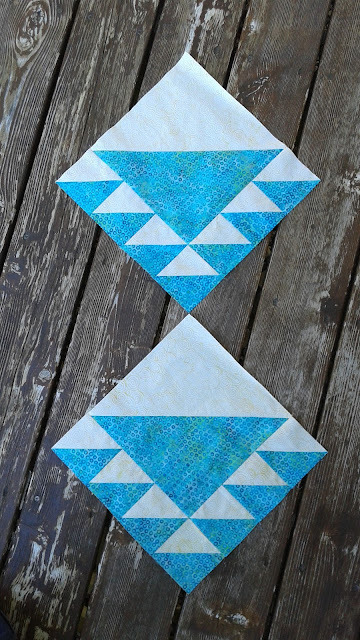 I decided the thing to do was to make two more blocks in similar, but different fabrics and put them together. Here's what happened. 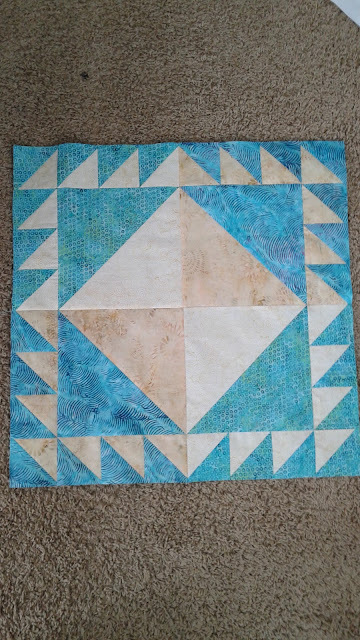 I really like it, but I felt like it needed a border because I really didn't want to try to hit all those triangle tips with my binding. You can see that I alternated colors for my border too. I like the contrast that it gives. I also had a lot of fun quilting this quilt. It's for my friend Susan who loves turquoise. Yes, those are my feet. Oops. Here you can see the detail of the feathers and the wavy lines I used in the triangles. And here is the feather I quilted in the center. I used 28 weight Aurifil thread in the top for this. I like the additional dimension the thicker thread gives though it was a little fussy for me. 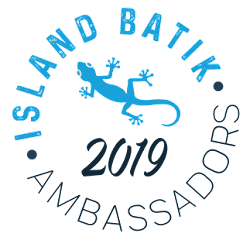 Be sure to check out the rest of the bloggers on this hop! What a lucky friend to receive this beautiful quilt. I'm sure she is going to love it. Thank you for sharing this lovely project with us. Your quilting design on that is beautiful. I'm sure your friend will love it. I like that color too. 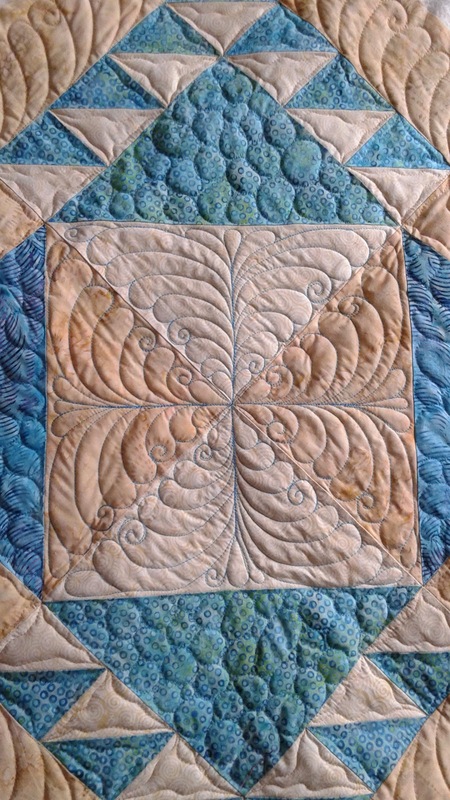 Wow amazing quilting on a beautiful piece! Your quilting looks so nice. That makes for a nice finish. Love the block and the quilting! wow your quilt block is lovely. your friend is going to love it. I love all the feathers you did. Lovely quilt and awesome detailed FMQing. Wow that turned out lovely. Your friend will be thrilled! Thanks for sharing. 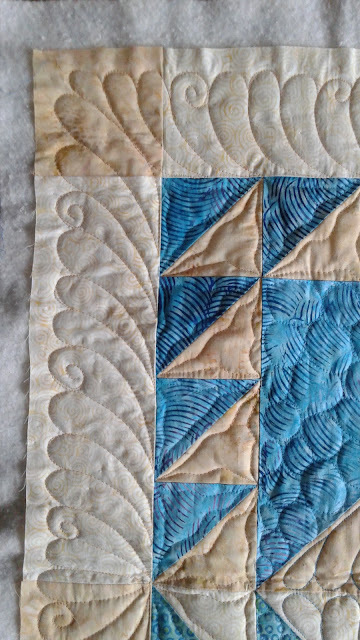 Love seeing the block from start through quilting details! Your quilting is great! Thanks for sharing your project. What a beautiful mini! I know your friend will love it. 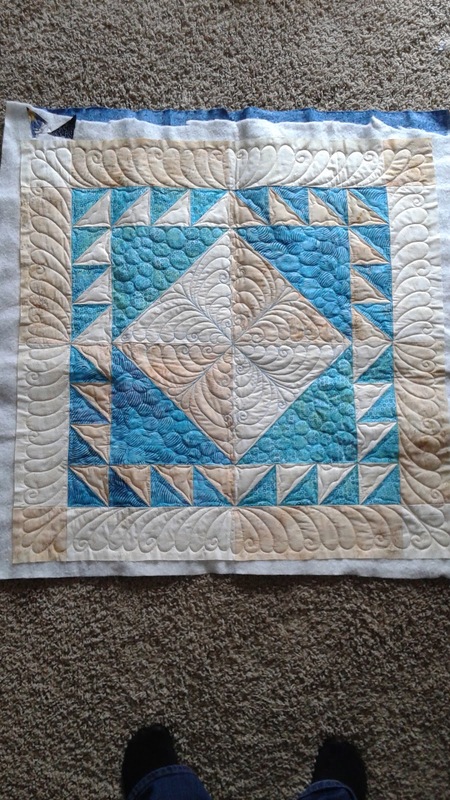 Your quilting is wonderful, Great job! Thanks for sharing! Ooo..feathers. I'm going to try and tackle that one day. 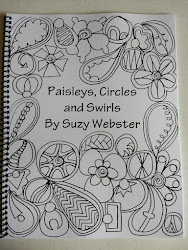 I have been practicing on FMQ. Thanks for sharing! So pretty! The quilting is fantastic. I love how you quilted it, awesome job! Your quilting was the perfect finishing touch! Your quilting is stunning! Love the color of your center block. Your friend is going to love this! Glad this linked to your actual blog, the other link on Rafflecopter linked to a private FB group. Beautiful quilting -- FMQ is something that I still hope to learn. Wow, your quilting is beautiful. Your friend's quilt is beautiful! She's very lucky to have a friend like you. Cute project. Wonderful quilting. Thanks for sharing. Cute little quilt, and your quilting is beautiful. You came up with a great solution for your UFO. As always your work is just stunning. You are the girl!!!!! Quilt Qwazy Queens Blog Hop Begins Today! Retail Therapy and Tula Pink All Stars!